Letter from Emma Goldman and Alex Berkman written to warn workers of the persecution of revolutionaries in Russia by the Bolsheviks, originally published in Freedom in 1922. 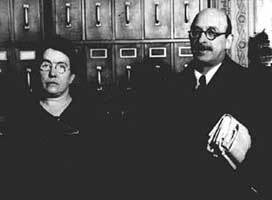 We have just received the following letter from our comrades Emma Goldman and Alexander Berkman, who are now stranded in Stockholm. This letter gives us the truth about the terrible persecution of Anarchists in Russia. We ask all Anarchist and Syndicalist papers to republish this letter, and we hope comrades in this country will help us in pushing the sale of this issue, of which we have printed a much larger number than usual. Dear Comrades, — The persecution of the revolutionary elements in Russia has not abated with the changed political and economic policies of the Bolsheviki. On the contrary, it has become more intense, more determined. The prisons of Russia, of Ukraina, of Siberia, are filled with men and women — aye, in some cases with mere children — who dare hold views that differ from those of the ruling Communist Party. We say “hold views” advisedly. For in the Russia of to-day it is not at all necessary to express your dissension in word or act to become subject to arrest; the mere holding of opposing views makes you the legitimate prey of the de facto supreme power of the land, the Tcheka, that almighty Bolshevik Okhrana, whose will knows neither law nor responsibility. But of all the revolutionary elements in Russia it is the Anarchists who now suffer the most ruthless and systematic persecution. Their suppression by the Bolsheviki began already in 1918, when — in the month of April of that year — the Communist Government attacked, without provocation or warning, the Anarchist Club of Moscow and by the use of machine guns and artillery “liquidated” the whole organisation. It was the beginning of Anarchist hounding, but it was sporadic in character, breaking out now and then, quite planless, and frequently self-contradictory. Thus, Anarchist publications would now be permitted, now suppressed; Anarchists arrested here only to be liberated there; sometimes shot and then again importuned to accept most responsible positions. But this chaotic situation was terminated by the Tenth Congress of the Russian Communist Party, in April, 1921, at which Lenin declared open and merciless war not only against Anarchists but against “all petty bourgeois Anarchist and Anarcho-Syndicalist tendencies wherever found. It was then and there that began the systematic, organised, and most ruthless extirmination of Anarchists in Bolshevik-ruled Russia. On the very day of the Lenin speech scores of Anarchists, Anarcho-Syndicalists, and their sympathisers were arrested in Moscow and Petrograd, and on the following day wholesale arrests of our comrades took place all over the country. Since then the persecution has continued with increasing violence, and it has become quite apparent that the greater the compromises the Communist regime makes with the capitalist world, the more intense its persecution of Anarchism. It has become the settled policy of the Bolshevik Government to mask its barbaric procedure against our comrades by the uniform charge of banditism. This accusation is now made practically against all arrested Anarchists, and frequently even against mere sympathisers with our movement. A mighty convenient method, for by it any one may be secretly executed by the Tcheka, without hearing, trial, or investigation. Lenin’s warfare against Anarchist tendencies has assumed the most revolting Asiatic form of extermination. Last September numerous comrades were arrested in Moscow, and on the 30th of that month the Izvestia published the official statement that ten of the arrested Anarchists had been shot “as bandits.” None of them had received a trial or even a hearing, nor were they permitted to be represented by counsel or be visited by friends or relatives. Among the executed were two of the best-known Russian Anarchists, whose idealism and lifelong devotion to the cause of humanity had stood the test of Tsarist dungeons and exile, and persecution and suffering in various other countries. They were Fanny Baron, who had escaped from prison in Ryazan several months previously, and Lev Tchorny, the popular lecturer and writer, who had spent many years of his life in the Siberian katorga for his revolutionary activities under the Tsars. The Bolsheviki did not have the courage to say that they had shot Lev Tchorny; in the list of the executed he appeared as “Turchaninoff,” which — though his real name — was unknown even to some of his closest friends. The policy of extermination is continuing. Several weeks ago more arrests of Anarchists took place in Moscow. This time it was the Universalist Anarchists who were the victims — the group which even the Bolsheviki had always considered most friendly to themselves. Amongst the arrested were also Askaroff, Shapiro, and Stitzenko, members of the Secretariat of the Moscow section of the Universalists, and well known throughout Russia. These arrests, outrageous as they were, were at first considered by the comrades as due to the unauthorised action of some over-zealous Tchekist agent. But information has since been received that our Universalist comrades are officially accused of being bandits, counterfeiters, Makhnovtsy, and members of the “ Lev Tchorny underground group.” What such an accusation means is known only too well to those familiar with Bolshevik methods. It means razstrel, execution by shooting, without hearing or warning. The fiendishness of the purpose of these arrests and accusations is almost beyond belief. By charging Askaroff, Shapiro, Stitzenko, and others with “membership in the Lev Tchorny underground group,” the Bolsheviki seek to justify their foul murder of Lev Tchorny, Fanny Baron, and the other comrades executed in September; and, on the other hand, to create a convenient pretext for shooting more Anarchists. We can assure the readers unreservedly and absolutely that there was no Lev Tchorny underground group. The claim to the contrary is an atrocious lie, one of the many similar ones spread by the Bolsheviki against the Anarchists with impunity. It is high time that the revolutionary Labour movement of the world took cognizance of the blood and murder regime practised by the Bolshevik Government upon all politically differently minded. And it is for the Anarchists and AnarchoSyndicalists, in particular, imperative to take immediate action toward putting a stop to such Asiatic barbarism, and to save, if still possible, our imprisoned Moscow comrades threatened with death. Some of the arrested Anarchists are about to declare a hunger strike to the death, as their only means of protest against the Bolshevik attempt to outrage the memory of the martyred Lev Tchorny after they had foully done him to death. They demand the moral support of their comrades at large. They have the right to demand this, and more. Their sublime self-sacrifice, their lifelong devotion to the great cause, their unswerving steadfastness, all entitle them to it. Comrades, friends, everywhere! It is for you to help vindicate the memory of Lev Tchorny and at the same time save the precious lives of Askaroff, Shapiro, Stitzenko, and others. Do not delay or it may be too late. Demand from the Bolshevik Government the alleged Lev Tchorny documents they pretend to have, which “involve Askaroff, etc., in the Lev Tchorny group of bandits and counterfeiters.” Such documents do not exist, unless they be forgeries. Challenge the Bolsheviki to produce them, and let the voice of every honest revolutionist and decent human being be raised in world-wide protest against the continuance of the Bolshevik system of foul assassination of its political opponents. Make haste, for the blood of our comrades is flowing in Russia. "Lenin’s warfare against Anarchist tendencies has assumed the most revolting Asiatic form of extermination." Anyone know what this is referring too? (from France) another explaination, besides Entdinglichung's one and compatible with his, is the fact that in the popular imagination of that time, more than nowadays -Nazism was not still in power- Gengis Khan, with his hordes, was seen as a symbol and if not "the same thing as Attila", not for sure, the-contrary-of-Attila.